While I enjoy Kingdom Builder, it’s unlikely to be a game that I seek out to play very often. It’s an obviously clever design, and as a Spiel des Jahres winner you have every reason to discount my opinion and dive head-first into its multi-hued environs. Do you want to build a kingdom? It doesn’t have to be a kingdom. Actually yes, it does. It has to be a kingdom. I’m sorry. Can we just move past that? I didn’t mean to imply you could build anything bu… look, just let it go. Let it gooooooo! We’ll tear this down like the break of dawn. 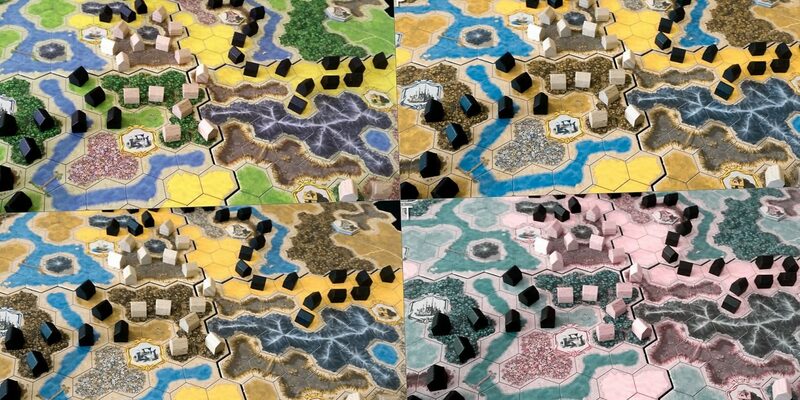 It’s evident in the map too – while certain categories of colour blindness will be work to make the kingdom a little more apocalyptic than one might like, there is enough of difference in colour palette, and in hex design, to uniquely identify each specific terrain. Fine for most people, but some problems if visual acuity is an issue. Having said that, some of the iconographic representations of the hexes don’t differentiate very well, which is going to be an issue if colour blindness is compounded by another visual condition. We’ll discuss that in our intersectional section. Overall, we give Kingdom Builder a strong recommendation in this category, with a salute to the designer and publishers that have taken such care to visually discriminate all game information with channels other than colour. For some terrains, the contrast between hex boundaries and the terrain itself is extremely low. This can make it difficult to effectively assess the implication of play. Knowing how many houses you’ll need to place before adjacency ceases to be an issue is important gameplay information. When visually interrogating the board to uncover the details of this, you will likely leak future intention. However, other than taking that area away from you opponents don’t have much of a chance to undermine your efforts. You can’t see the forest, or the hex boundaries, for the trees. The game requires an awful lot of tightly contextual information, all of which is gained from visual data cues. You need to know where the terrains are, how big they are, how they are disposed with relation to scoring elements, and the degree of adjacency they have with other kinds of terrains. This is going to be a lot to keep track of, and some scoring conditions layer in additional difficulties. For example, the Merchant scoring card gives points for each location connected via settlements to a castle. That means not only do you need to know where they are in relation to each other, you’ll need to be able to map out an efficient path between them. Lords, hermits and farmers all have scoring systems that work based on the distribution of settlements across sectors, which can be difficult to determine at a glance for anyone. Hermits and citizens have scoring rules based on clustering, with the points based on either the number of discreet settlements or the largest settlement areas. All of this comes in to end-game scoring, so it’s not necessarily a problem in regular game flow. If you want to guesstimate how you’re doing in relation to everyone else though it can be more of an issue. Each of the special location tiles you collect comes with a small iconographic representation that explains, sort of, what they do. This can be difficult to read, especially since there is considerable overlap between the symbolic elements. 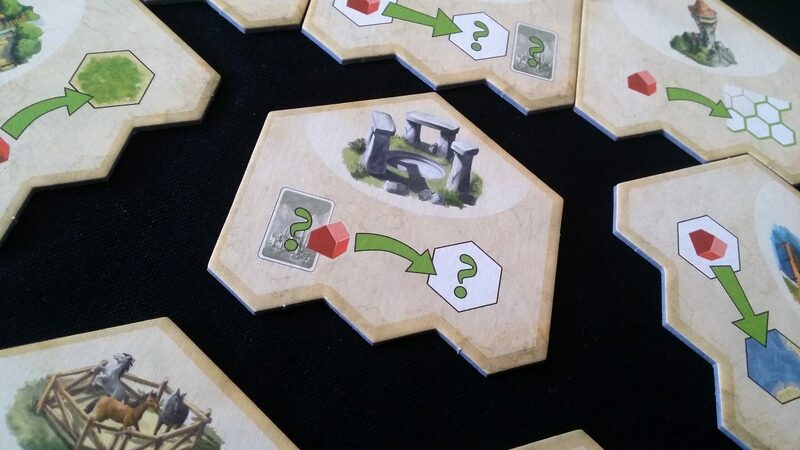 There are large print tiles though that can be put near visually impaired players, but there’s still going to be a fair degree of cross reference required in order to play. Luckily, only a subset of these rules are in play in any given game which alleviates some of the burden on memory. 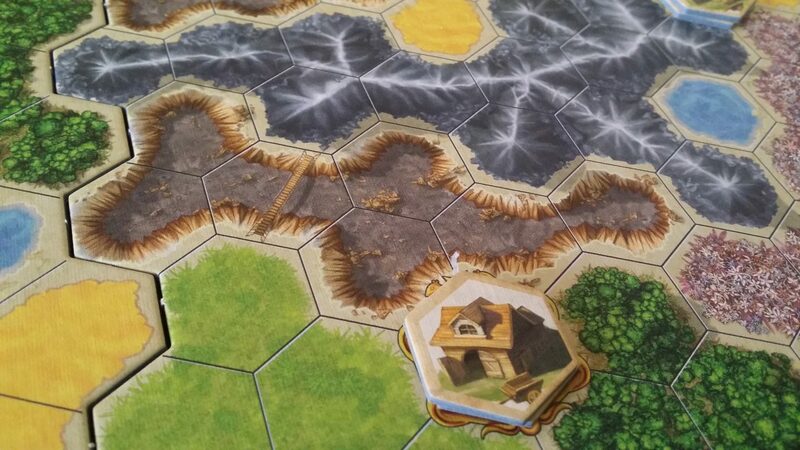 More positively, while hex borders are not especially well contrasted within certain tiles, the terrains themselves are very bright and vibrant, aiding visual identification. It is reasonably easy to work out the rough location of terrains even if the specific number of tiles and their contents is less easy to make out. The game reaches its end state when a player places their last settlement. For a visual impaired player, the houses are tactile reminders of how many are left to be placed. When assessing how close the end-game may be though it’s necessary to observe how many houses each player has in their possession. Asking is not something that will necessary leak game information, but given the mutability of the rules it might need to be asked reasonably often unless players adopt a convention of reporting on house counts at the end of each play. 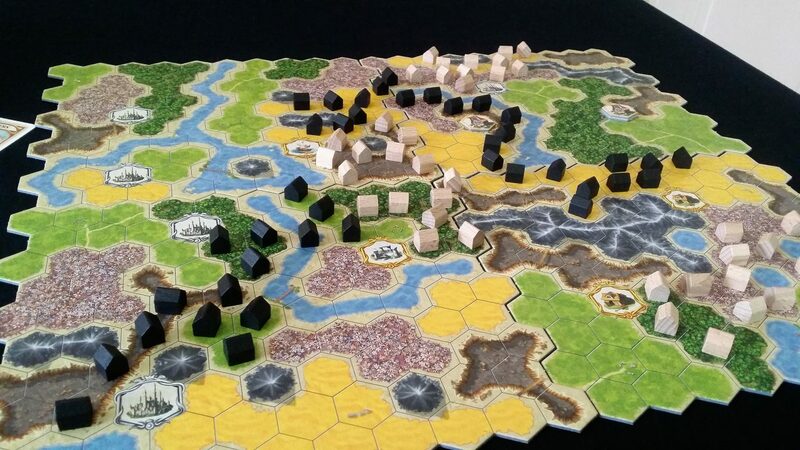 Overall, given the size of the game board and the highly dependent spatiality of gameplay, we can’t offer a recommendation for Kingdom Builder in this category. However, for those with some degree of visual discrimination they will probably be able to play it, with care, if they wish to make the effort. It’s not unplayable, in our estimate – it’s just more troublesome than a game we’d be prepared to tentatively recommend. As we expressed in our review of Kingdom Builder, it’s not a complicated game but it does have an emergent element of economic assessment that is cognitively expensive. However, that’s only true if you’re worried about hyper-competitive gameplay. To play well requires a deep consideration of the implication of placement and how everything fits together. It needs a kind of flexible and responsive master-plan that is considered in relation to the current scoring rules and the contention over prime real-estate. There are some considerations with regards to gameplay that are important from a cognitive accessibility perspective. The first is that while game turns are consistent and reliable, internal turn structure is highly mutable. Everyone draws a card, and then places three settlements. And then none, one or more extra actions are performed. The number of options a player has will increase over time, adding in limited repeatability of certain actions. Placing a settlement will usually be adjacent to existing settlements, but maybe not. Extra actions might have relatively complex outcomes – paddocks let you leapfrog a settlement over another, for example. Towers let you build on the edge of a game board. The harbour lets you move a settlement to a water hex. Depending on the location tiles you’ve picked up, you can perhaps do these multiple times, in varying orders, with varying impact. Every other player will likely have a different set of actions they can do. The location tiles represent the most significant element of cognitive complexity in the game. The exact complexity will depend on the random setup – some combinations are simple, and some are less so. The second most significant element is the nature of scoring, which can be quite complicated. It’s all done at the end, and while many scoring cards are simple others require a considerable degree of comparison, certainly at larger player counts. The Lord card for example gives 12 victory points to the player with the most settlements in an area, and 6 points to the player with the second largest number. And that’s for each sector. It’s certainly not Sheriff of Nottingham levels of faffing about, but it is markedly more complicated than ‘one victory point for each settlement by a river’. 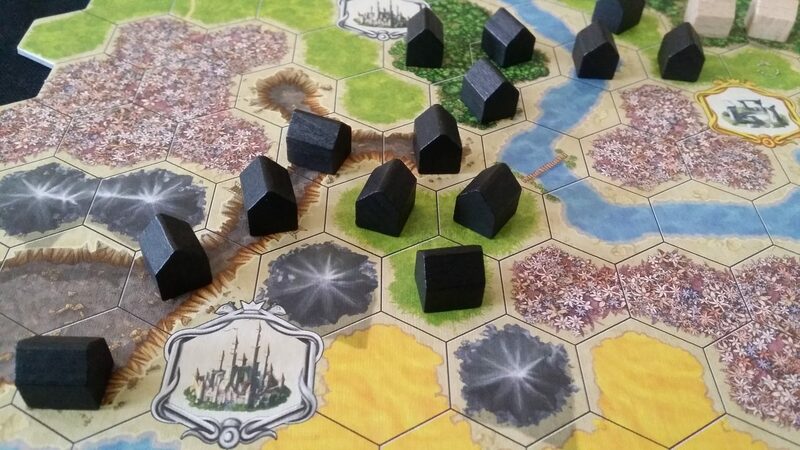 If Kingdom Builder is a game to be played regularly, then the variability of game setup is going to be a significant barrier to play. 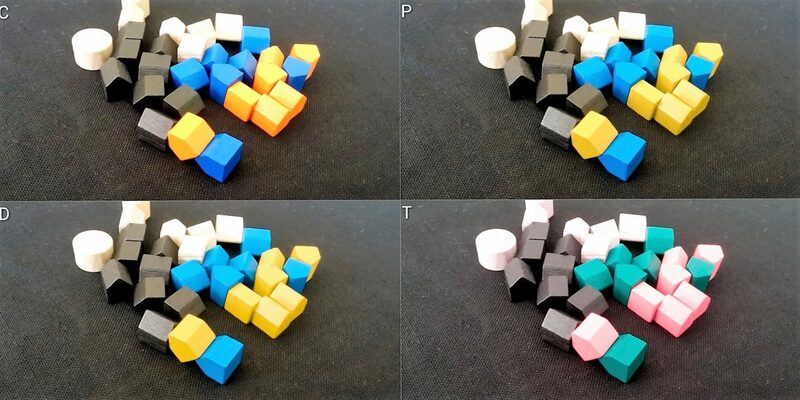 While the basic game flow doesn’t change with new game setups everything else does – the perceived and invisible value of hexes changes with scoring, and the feasibility of strategies changes with the actions available. Just as someone feels they have mastered how the game works, it changes. This high mutability is going to be a serious issue if Kingdom Builder is to be played in its ‘out of the box’ state. The extra actions are relatively simple, but sometimes they synergise especially well with certain scoring cards. The paddock, which allows you to move a settlement two hexes in a straight line, fits beautifully into the Hermit scoring condition which rewards players for many small clusters of settlements. The tavern, which allows a player to add a settlement to the end of a line, works very well with the Knight and Discoverer cards. Someone that can understand the moving parts of the game and mentally organise them for maximum impact will be at a huge advantage when playing. If relying more on rote memorisation and familiarity, that’s not going to be an option because that efficiency calculation is contextual on a highly variable game state. For those with memory impairments, all information is presented in front of them for investigation. The tiles you collect from locations come with an iconographic language on the back which is supposed to aid in recall. However, they’re not particularly intuitive and in most cases you’re going to have to simply explain with reference to the manual. Success can be meaningfully pursued without a coherent strategy for synergy or maximisation of opportunities. You can just focus on the things in front of you. You probably won’t win against someone playing with all engines firing, but you’ll make progress every turn. So, out of the box the game is reasonably accessible to those with memory impairments, but probably not appropriate for those where fluid intelligence accessibility must be accommodated. However, there is a cognitively accessible variant in here we think. Building up a kingdom is inherently satisfying – it just feels good to make patterns, without worrying too much about the potentially cut-throat contention over resources. The key points of competition comes in with the shared scoring – everyone values the same hexes, so the game is a race to claim the choicest real estate. Different scoring rules for each player would alleviate this whilst maintaining meaningful competition. Or, as with what we suggested for Carcassonne, you can play a collaborative version aimed at maximising score. For dealing with the game variability, the easiest thing to do is pick a satisfying setup and stick with it, varying it only incrementally one element at a time. In the manual there is a suggested setup for the first game that would be a good baseline for this. The game works well for all combinations of actions and scores, but some of these combinations are more complex than others. It’s possible to greatly reduce cognitive cost with careful selection without ‘cheating’ as such. Whatever combination you come up with is one that could have emerged randomly. As such, we offer a recommendation for those with memory impairments, and a tentative recommendation if fluid intelligence is a consideration. That recommendation is contingent on you being happy with stacking the deck a little to create the game variants that have the least cognitive cost. The only competition really comes in over real-estate, and it’s only at the latter stages of the game (and with larger player counts) that it will become especially cut-throat. In the earlier stages of the game, there’s enough room for everyone. As such, there are few real emotional triggers in the game. The extent to which players can get in the way of each other depends on the scoring rules. 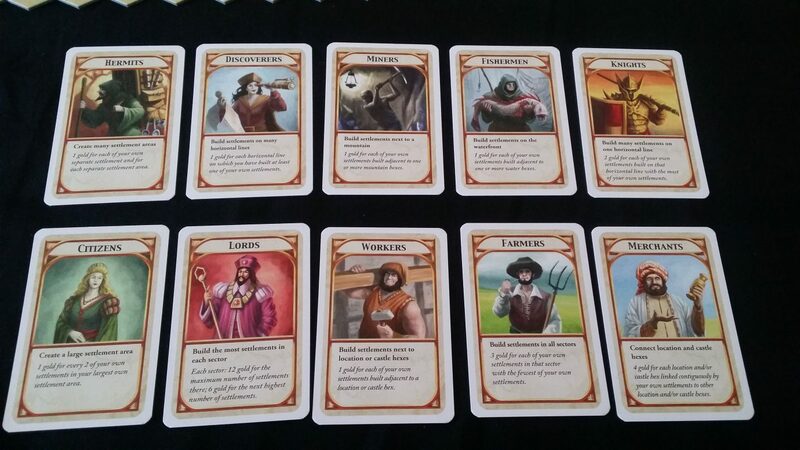 The Merchant Kingdom Builder card, which gives points for connecting castles and locations, permits players to block each other through judicious building. The worker scoring card (points for hexes next to a castle) means that a player can encircle a castle and prevent others taking advantage. Lords and knights put special contention over settlement distribution, and so on. It’s a very indirect competition though, and being blocked from taking advantage of one scoring rule means you’re likely being left open for another. Scoring is transparent and can be calculated while the game is playing, but no explicit scoring is done until the end. Given the different scoring rules, unless someone is intent on identifying the presumptive winner, the best most people will have is an idea of who’s in the lead. The design of Kingdom Builder does permit ganging up to stop a runaway winner, but it doesn’t support it. When making a mistake in Kingdom Builder, the implications can be considerable. If you make a bad placement in your first turn, it’s perfectly possible that you will never be able to create new settlement clusters elsewhere in the map. This however is a mistake you rarely make twice, and the manual explicitly gives you hints on placing your first settlement. There’s no real excuse for poor placement in your first turn, but that doesn’t necessarily mitigate anger or frustration at seeing the situation rapidly escaping out of your ability to control. While some extra actions would permit you to undo some mistakes, they’re dependant on being able to claim them faster than your opponents can. There’s a limit of two actions available at each hex, and you’re at the mercy of the one single draw card you get when it comes to claiming it. 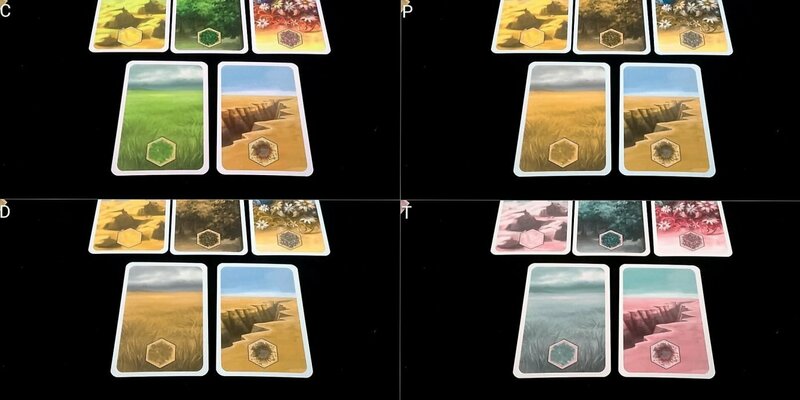 These cards may, due to the adjacency rules, end up with you moving farther away from your goal, rather than closer to it. Scoring disparities can be considerable, but usually won’t be especially large. There are some opportunities for doubling up on scoring with careful placement – usually though you’ll be working a single card at a time with each turn. Overall you’ll be making reasonable progress towards a decent score provided you’re at least passingly familiar with what the details are of the current scoring context. As such, while a humiliating loss is a possibility, it’s not one to fret about unduly. There are very minor worries, and we have no hesitation in strongly recommending Kingdom Builder in this category. The boards only nestle together, meaning that if you nudge them inadvertently they’ll go out of alignment, potentially knocking all the settlements out of place. The location tiles are stacked in small piles, but as a consequence of gameplay you might be trying to pluck them out of a relatively dense knot of houses. The dimensions of each hex are reasonably generous, but not overly so. It’s probably not going to be a huge problem but if fine grained motor control is an issue you may find a certain degree of tidying up is required as a result of each interaction with the board. 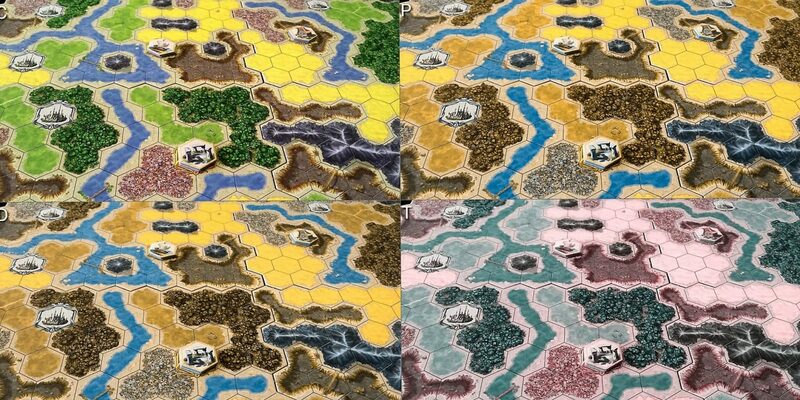 Placing the location tiles at the start isn’t a major difficulty given how only two go on each hex. You’re only dealing with a subset at a time though and there’s a degree of hunting them out needed before they can be positioned. They’re double sided, but with different symbols on each obverse and quite small and fiddly to position. You have forty settlements, and you’ll be looking to place them across the entire expanse of the board. There is clumping of placement to begin with, but it’ll rapidly give way to a more open exploration of the map. You don’t have ‘your side’ of the board, every sector of the board is going to be of interest to everyone. As such, if you can’t lean over or navigate around the board it’s going to be somewhat frustrating. That said, there’s not a lot of manipulation of tokens other than drawing a card and placing a settlement. You have to move settlements on occasion, but that’s about it. Tiles when they are collected are placed ‘icon up’ in front of you as a reminder of actions, but play no other meaningful role in proceedings. Spatiality is important, but the hexes are large enough that you don’t need especially delicate detail work in placement. However, you often will be manipulating tokens in a dense mass of other tokens, so that has to be taken into account. Just move everything everywhere. I’ll tell you when to stop. Let’s say you have a paddock, and you want to leapfrog a settlement into a flower field. You’d need to precisely articulate which settlement, which flower field, and in which direction. You can do an exhaustive negotiation with other players if they are needed to make physical actions on your behalf, but it’s an unnecessary complication. Given the nature of the slotted board sectors, it’s not feasible to have a map wide co-ordinate system but one local to each sector would have been possible. Better yet, the whole situation has an easy fix that would simultaneously address the weird redundancy of scoring boards mentioned in our review. A foldable frame, acting as a perimeter scoring track, could let you slot the sectors securely in place and provide a co-ordinate system that works across the entire map. Right away you solve the problem with nestling boards without needing them to snap together, whilst turning a game that is difficult to verbalise into one that has instructions that are fully communicable. We don’t usually make it a point in these teardowns to design solutions to the issues we discuss (but publishers/designers – feel free to drop us a line if you want to chat about this kind of thing), but unless something is fundamental to game design there almost always is a solution. Given all of this, we can’t recommend Kingdom Builder in this category, but as with our discussion on visual accessibility if you really want to play it you probably can. You can even build your own cardboard frame to ease the problems if you’re especially keen. 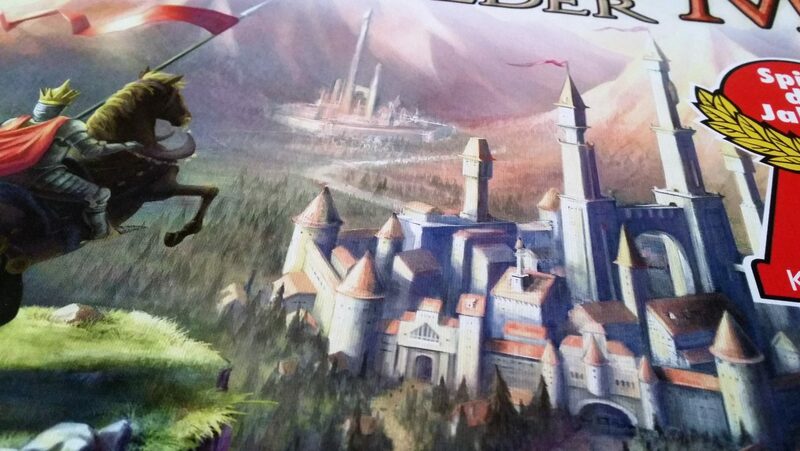 Out of the box though, we think Kingdom Builder is probably more trouble than it’s worth for those for whom physical accessibility is important. There are no specific issues here with Kingdom Builder. There is some reading associated with the cards, but the scoring implications can be easily communicated without specific reference to them. As such, we strongly recommend Kingdom Builder in this category. It’s Brianne. It is known. It’s a mixed bag here. At forty pounds too, it’s a pricey game for something that plays a maximum of four players. True, you get a lot of variety in the box for that money. While the scoring rules do substantively change the tenor and flavour of the game they don’t meaningfully alter the game experience. It’s primarily combinatorial variety – a difference in emphasis rather than anything else. As such, the seemingly endless variety is something of a magic trick, and after a while you’ll see the wizard behind the curtain. It plays well at all player counts though, and at an approximate playtime of forty-five minutes you’ll find many opportunities to get it down from the shelf if you like it. We’re prepared to offer a tentative recommendation in this category, with that recommendation becoming less tentative the cheaper you can find it for sale. The main issue in terms of intersectionality is that while the game is fully considerate of colour-blindness that’s not going to be true if a compounding visual impairment is to be considered. Many of the icons, when viewed through a colour blind palette, lack differentiation when also considered in relation to limited visual acuity. The issues regarding board busyness that we discussed in the section on physical accessibility are going to compound heavily if paired with a visual impairment. Of course we don’t actually recommend it in either of those categories so you could have guessed that already. The game reasonably easily supports dropping in and out, although if dropping below two players the experience is going to be perfunctory for the one remaining. Nobody is heavily impacting on anyone else during their turn except through the medium of the map. When settlements are placed they are only moved when certain actions are performed and only by their owner. As such, if someone must excuse themselves as a result of discomfort, everyone else can keep on playing until the end. At a playtime of forty-five minutes though that shouldn’t be necessary in most situations. The game is competitive, but it is not intensely so – however, given the wide expanse of the board and the complex range of possible choices it’s easy for someone to miss out on key information through its inaccessibility. The competitive element means that there is a disincentive for players intent on winning to go out of their way to point out mistakes or missed opportunities. Just aim to play with a good group where that’s not likely to be an issue. Otherwise, since there are no hidden hands, complex conditional cards or dice rolls the usual intersectional issues we discuss here tend not to raise their head in a game of Kingdom Builder. Kingdom Builder isn’t the most accessible game we’ve looked at, but it’s also pretty far from the worst. It’s a mix of the very good (colour blindness support, and a lack of emotional trigger issues) and the quite bad (visual accessibility, and verbalisation support). As we discussed in our Isle of Skye teardown, we believe that the standard of accessibility to which we should hold prominent titles, such as those that have won the Spiel des Jahres, should be higher than other games. These are titles that appear in German supermarkets, with the implication that they are games everyone can enjoy. They’re the titles that are most prominent when new board gamers start investigating the hobby. They’re our cardboard ambassadors. We gave Kingdom Builder 3.5 stars in our review, and that wasn’t out of a lack of cleverness or fun, but more out of a lack of anything very exciting that emerged from play. However, it’s certainly a worthwhile experience on which you won’t resent spending your time. If you like the sound of it, and you think it’s compatible with your accessibility needs, you can certainly do worse than giving it a go.